The following is the full text of Prime Minister Tony Blair's speech on the London bombings, delivered at the Labour Party national conference on Saturday. The greatest danger is that we fail to face up to the nature of the threat we are dealing with. What we witnessed in London last Thursday week was not an aberrant act. It was not random. It was not a product of particular local circumstances in West Yorkshire. Senseless though any such horrible murder is, it was not without sense for its organisers. It had a purpose. It was done according to a plan. It was meant. What we are confronting here is an evil ideology. It is not a clash of civilisations - all civilised people, Muslim or other, feel revulsion at it. But it is a global struggle and it is a battle of ideas, hearts and minds, both within Islam and outside it. This is the battle that must be won, a battle not just about the terrorist methods but their views. Not just their barbaric acts, but their barbaric ideas. Not only what they do but what they think and the thinking they would impose on others. This ideology and the violence that is inherent in it did not start a few years ago in response to a particular policy. Over the past 12 years, Al-Qaeda and its associates have attacked 26 countries, killed thousands of people, many of them Muslims. They have networks in virtually every major country and thousands of fellow travellers. They are well-financed. Look at their websites. They aren't unsophisticated in their propaganda. They recruit however and whoever they can and with success. Neither is it true that they have no demands. They do. It is just that no sane person would negotiate on them. This is a religious ideology... Those who kill in its name believe genuinely that in doing it, they do God's work; they go to paradise. They demand the elimination of Israel; the withdrawal of all Westerners from Muslim countries, irrespective of the wishes of people and government; the establishment of effectively Taleban states and Sharia law in the Arab world en route to one caliphate of all Muslim nations. We don't have to wonder what type of country those states would be. Afghanistan was such a state. Girls put out of school. Women denied even rudimentary rights. People living in abject poverty and oppression. All of it justified by reference to religious faith. From the mid 1990s onwards, statements from Al-Qaeda, gave very clear expression to this ideology: "Every Muslim, the minute he can start differentiating, carries hatred towards the Americans, Jews and Christians. This is part of our ideology. The creation of Israel is a crime and it has to be erased. "You should know that targeting Americans and Jews and killing them anywhere you find them on the earth is one of the greatest duties and one of the best acts of piety you can offer to God Almighty. Just as great is their hatred for so-called apostate governments in Muslim countries. This is why mainstream Muslims are also regarded as legitimate targets". 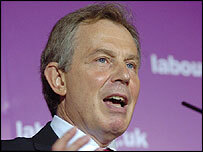 Mr Blair said the "devilish logic" of their claims must be exposed. At last year's (Labour) party conference, I talked about this ideology in these terms. Its roots are not superficial, but deep, in the madrassas of Pakistan, in the extreme forms of Wahabi doctrine in Saudi Arabia, in the former training camps of Al-Qaeda in Afghanistan; in the cauldron of Chechnya; in parts of the politics of most countries of the Middle East and many in Asia; in the extremist minority that now in every European city preach hatred of the West and our way of life. This is what we are up against. It cannot be beaten except by confronting it, symptoms and causes, head-on. Without compromise and without delusion. The extremist propaganda is cleverly aimed at their target audience. It plays on our tolerance and good nature. It exploits the tendency to guilt of the developed world, as if it is our behaviour that should change, that if we only tried to work out and act on their grievances, we could lift this evil, that if we changed our behaviour, they would change theirs. This is a misunderstanding of a catastrophic order. Their cause is not founded on an injustice. It is founded on a belief, one whose fanaticism is such it can't be moderated. It can't be remedied. It has to be stood up to. And, of course, they will use any issue that is a matter of dissent within our democracy. But we should lay bare the almost-devilish logic behind such manipulation. What was September 11, 2001 the reprisal for? 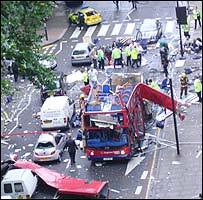 Why even after the first Madrid bomb (in March 2004) and the election of a new Spanish government, were they planning another atrocity when caught? In the end, it is by the power of argument, debate, true religious faith and true legitimate politics that we will defeat this threat. Why if it is the cause of Muslims that concerns them, do they kill so many with such callous indifference? We must pull this up by its roots. Within Britain, we must join up with our Muslims community to take on the extremists. Worldwide, we should confront it everywhere it exists. Next week I and other party leaders will meet key members of the Muslim community. Out of it I hope we can get agreed action to take this common fight forward. I want also to work with other nations to promote the true face of Islam worldwide. Round the world, there are conferences already being held, numerous inter-faith dialogues in place but we need to bring all of these activities together and give them focus. We must be clear about how we win this struggle. We should take what security measures we can. But let us not kid ourselves. That means not just arguing against their terrorism, but their politics and their perversion of religious faith. It means exposing as the rubbish it is, the propaganda about America and its allies wanting to punish Muslims or eradicate Islam. It means championing our values of freedom, tolerance and respect for others. It means explaining why the suppression of women and the disdain for democracy are wrong. The idea that elected governments are the preserve of those of any other faith or culture is insulting and wrong. Muslims believe in democracy just as much as any other faith and, given the chance, show it. We must step up the urgency of our efforts. Here and abroad, the times the terrorists have succeeded are all too well known. Less known are the times they have been foiled. The human life destroyed we can see. The billions of dollars every nation now spends is huge and growing. And they kill without limit. They murdered over 50 innocent people (in London) last week. But it could have been over 500. And had it been, they would have rejoiced. The spirit of our age is one in which the prejudices of the past are put behind us, where our diversity is our strength. It is this which is under attack. Moderates are not moderate through weakness but through strength. Now is the time to show it in defence of our common values."